Graphic design by 3 Fish in a Tree inspired by henna tattoos these placemat and coaster sets offer a new direction in style. 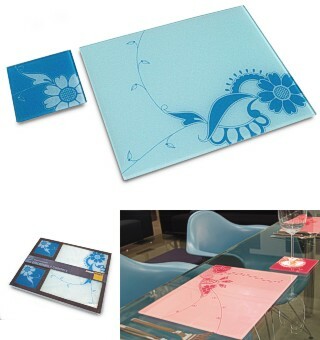 Manufactured from toughened glass with non-slip feet this set will both protect and add colour to your table. Set of 2 placemats 30.5 x 25 cm (12 x 10 inches) and 2 coasters 11cm (4.5 inches) square.